Flat Rock Metal has installed a unique piece of equipment that allows a new, optimum processing approach to producing specific blank configurations common to many automotive laser welded blanks. This blank configuration is rectangular at one end and trapezoidal at the other. Some refer to this blank configuration as a “half trap”. The traditional method of producing this blank would be to start with a slit coil and process as an oscillating shear / one-out or if the oscillating angle is large it would require processing with a die as a one-out or two-out blank. This is a costly process when considering the slitting and subsequent blanking of narrow coils and potential tooling costs, etc. 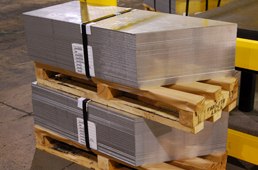 Flat Rock Metal’s proposed approach is to multi-blank to a double length rectangular blank and then to process the individual double length blank on the new high speed, automated angle shear in a one sheet in / two blanks out. The ability to start with wide master coils, multi-blank in a three or four out process and then a two out angle shear reduces cost as a result of the more productive processes. In addition, the elimination of potential tooling costs and a reduction in steel cost (size extras), etc leads to significant overall cost reductions. The new Angle Shear is flexible and can process blanks with any angle up to a 60 degree angle cut. 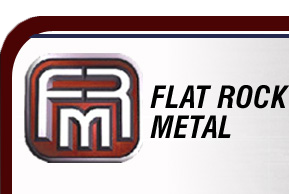 The line was designed and manufactured by Flat Rock Metal’s own Engineering, Maintenance and Operations Departments. 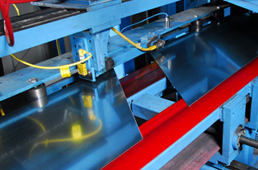 Like other sheet fed process lines at Flat Rock Metal, it is an automated line with pneumatic de-stacking and magnetic blank conveyors and stacking systems. 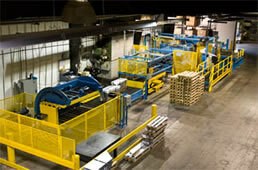 The actual gauging and dimensional control system of the angle shear cut is unique and is Patented in both the United States as well as Canada. After stacking, the lifts can be turned over if necessary on a pack turner that was installed in-line. Most of these blank configurations are normally a left / right type part that requires one of the stacks to be turned over.